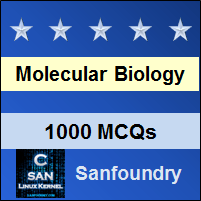 This set of Molecular Biology Multiple Choice Questions & Answers (MCQs) focuses on “Methylation of Eukaryotic DNA Controls Gene Expression – 1”. 1. 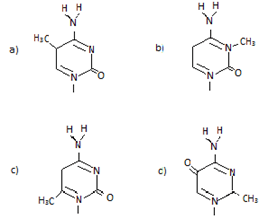 Methylation at which of the following bases is possible within the following oligonucleotides? Explanation: In eukaryotes, DNA methylation occurs predominantly at CpG dinucleotide sequence. In CpG, the intervening ‘P’ represents the phosphodiester bond linking cytosine- and guanine-containing nucleotides. 2. Which is known to be methylated in eukaryotic cells? Explanation: In eukaryotes only the cytosine residue is methylated. In prokaryotes both adenine and cytosine residue is methylated. 3. Among the following which shows the maximum rate of cytosine methylation? Explanation: Cytosine methylation is relatively rare in lower eukaryotes. But the cytosine residue in vertebrates is upto 10% of the total number of cytosine bases are methylated and in plants upto 30%. 4. Which of the following is the prototype of correctly methylated base? 5. The region of maximum methylation in the genome is predominantly activated. Explanation: The regions in the genomic DNA which has a high number of methylated cytosine are usually transcriptionally inactive. Silencing is thought to be either due to direct inhibition of transcription factors binding as a result of methylated cytosine or the binding of other proteins with methyl-binding domain of the DNA. Explanation: Prokaryotic methylation occurs at both adenine and cytosine residue. The main function of DNA methylation in prokaryotes is to provide protection from its own endonucleases. It also plays an important role in mismatch repair. 7. How many types of methylation processes are known in eukaryotic cells? Explanation: There are two types of methylation processes known in eukaryotic cells. They are maintenance methylation and de-novo methylation. Explanation: Maintenance methylation is done in the newly synthesized DNA strand at opposite positions of the methylated sites on the parent strand. In de-novo methylation, addition of methyl groups occur at totally new positions. 9. Both de-novo methylation and maintenance methylation ensures the methylation pattern is inherited from parent to daughters. Explanation: Maintenance methylation is done in the newly synthesized DNA strand at opposite positions of the methylated sites on the parent strand. The maintenance activity ensures that the two daughter DNA molecules retain the methylation pattern of the parent molecule. Explanation: The methylation of cytosine increases the transition mutation of cytosine to thymine. This is caused by the process of deamination of the 5-methyl-cytosine residue.